Created on May 30, 2013, 5:27 p.m. by antonkulaga & updated by iliastambler on May 31, 2013, 7:25 p.m. antonkulaga on May 31, 2013, 7:25 p.m. Hevok on May 31, 2013, 7:25 p.m. It is of general importance: Deciphering the aging process requires new innovative paradigms. Only Manhattan project-like endeavors such as the construction of a digital deciphering machine and the innovation of Open Distributed Science applied to aging research might be able to utilize the immense amount of biological information to reverse engineer the basic aging processes and provide us with insights that are absolutely vital to make reversing the aging process possible. The aging process is one of the biggest and most fascinating mysteries of biology. It is one of the oldest puzzles of mankind and a chief biomedical problem of the 21st century. It is of general importance, because it affects all human beings and afflicts a huge economic and social burden to all nations on earth. Aging kills over 150 000 people every day. Age-associated diseases and disability represent a huge and growing morbidity in an aging human population, reflected in an increasing clinical load and burden on national economies. Aging is a very complex phenomena that operates on many hierarchical and system levels from cellular and tissue levels - to the level of the whole organism, population and species. Its evolutionary “why” (theory) and physiological “how” (molecular mechanism) remain enigmatic. It is impossible to describe and “decode” the aging process without the integration of heterogeneous biomedical data, collaborative work of scientists and programmers from many disciplines and extensive use of computation that will help researchers to test their reasoning over huge corpus of gathered data and infer new knowledge out of them. Aging is also a social issue. Most of the diseases that are leading causes of death (cardiovascular and metabolic diseases, neurodegeneration, cancer, etc.) are all derivatives of aging. Currently, academia, industry and society is mostly focused on these derivatives, while the major focus should be on the root cause -- aging. So a huge social effort is needed to shift the focus of the society from fighting the consequences to eliminating the root cause itself. That is why lobbyists, journalists, artists, politicians and other social activists have to work together with scientists and programmers to achieve the common goal. As for any complex phenomena affecting both scientific and social issues, as well as heavy computations over big data where a lot of people and organizations are involved, a platform is needed to integrate everything together. Exactly this is the main objective of the Denigma Project [http://denigma.de]. Denigma is a project of the International Longevity Alliance [http://longevityalliance.org/] intended to provide a starting point for deciphering aging. By integrating all the heterogeneous types of biological data and applying a robust unification schema as well as utilizing the increasing computational power for logical inference, it will be possible to solve biological problems, primarily aging and aging-related diseases as well as suffering due to other reasons. The first and imminent step in this direction is creation of the aging knowledge base that implies integration of data from various sources. Currently biomedical knowledge is scattered in heterogeneous formats. It is present in the form of unstructured academic articles, semi-structured datasets, structured databases and non-accessible in the minds of experts. This renders this heterogeneous knowledge inaccessible for global computing [Attwood et al., 2009]. Knowledge in the form of free text needs to be converted into a structured form, while individual articles, datasets and databases need to be mapped for modular access and converted into the same structure. This process can be automated, but not completely and therefore requires human reasoning (i.e. crowdsourcing). Crawlers identify information in the web and gather the data. Natural language processing (by interpreters) converts raw textual information into a formal knowledge representation. Parsers read data from datasets and databases and output as well as updated structured information that they derive with a unifying schema. As automated processing is highly error prone, human reasoning over the knowledge base is initially obligatory. Humans can access the knowledge base via semantic tools for effective collaborations which are for instance a semantic chat command line, a collaborative data editor, an interactive and dynamic graph representation, and an universal API. A key technology to enable such a multi-layered data integration is ontology engineering. An ontology is an explicit formal specification of a shared conceptualization [Gruber T, 1995]. 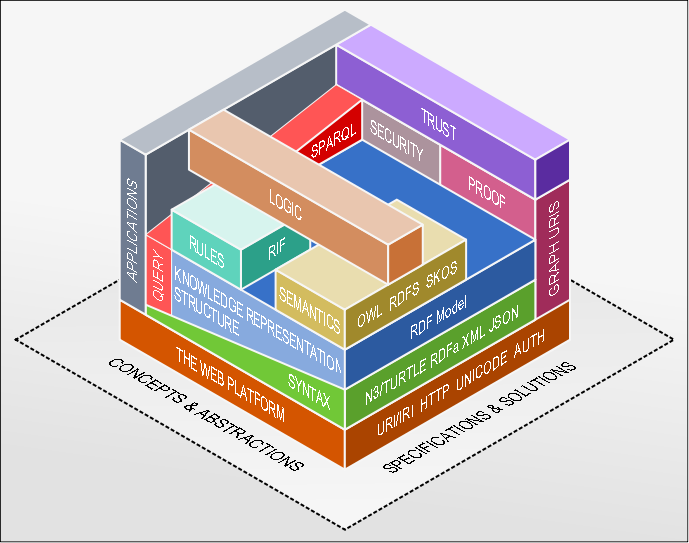 It is a basis for so-called Semantic Web Stack, a set of technologies that let researchers describe heterogeneous data and run reasoning computer algorithms over it [Figure: Semantic Web Stack]. Currently there are hundreds of biological and medical ontologies [http://bioportal.bioontology.org/ontologies]. The most famous of them is Gene Ontology [http://www.geneontology.org/] that was developed in the Human Genome Project. Unfortunately most of current biomedical ontologies are of poor quality and are not integrated with each other, so there are resources like The "Open Biological and Biomedical Ontologies" (OBO Foundary) [http://obofoundry.org/] that try to establish quality standards and integrate various ontologies with each other. Ontologies specific for aging research are necessary and being developed on Denigma. Those ontologies will be used by the above mentioned programs to classify and systematize information. Together with data integration domain specific tools are needed. There are some common tools and approaches specific for aging research. In order to understand aging it is common to conduct comparisons. Different life forms age with a wide range of paces (from days to centuries) and some appear not to age at all (negligible senescence) or were even classified as immortal (for instance species like Jellyfish and Hydra). There are also some correlations between longevity, various traits and the conditions in which species evolved. Larger animals usually tend to live longer. Mouse lives 2 years, a dog 15 years, a horse 40 years, an elephant 70 years, it is a normal straight upward sloping line. 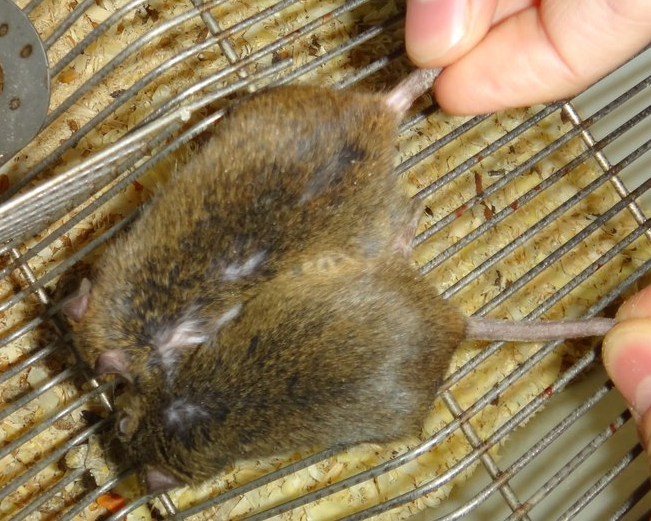 However, there are big exceptions, like bats, which have the size of mice, live 30 years. Humans about the size of a large dog can live 120 years, little lobster can live 220 years, little turtles can live 150 years, some birds like parrots can live 90 years and arctic clams can live 250 years, deep dwelling rock fish can live 150 years. What do they all have in common? They all have a great defense to predators, full body armor, extreme intelligence, flight, and isolation. Within a species different individuals have different genetic variants and some of them affect the rate of aging. Single gene mutants can greatly extend or shorten the lifespan in model organisms. Also in humans there are individuals that have the genetic markup to live above a century (centenarians). Whole populations have different peculiarities and some populations live longer than others. It is very common that a genetic variant that correlates with longevity in one population does not in another. Young an old animals have a lot of differences that can be compared in all levels or hierarchy. In Denigma there are datasets that include References to the literature and Changes occurring on multiple levels in an organism as well as their relations. Comparisons let researchers understand what changes with organisms when they age so it is easier to plan experiments. Some experiments let aging researchers purify the factors of aging such as those from the blood. This kind of experiments is known as Heterochronic Parabiosis [Figure: Heterochronic Parabiosis]. In such experiments the blood systems of two animals are coupled, so hemopoietic stem cells, lymphoid cells, serum factors, hormones, and other elements are exchanged. The results of those studies indicate the complexity of the phenomena of aging. In most of the cases the young mouse becomes older but the older one does not rejuvenate much (that is highly counterintuitive) [Pishel; Shytikov, et al., 2012] Such experiments were also conducted on lower levels: organ replacement, blood transfusion, etc. All these comparisons can be done at all levels of hierarchy, starting from gene and cellular levels. As the main goal of aging research is finding ways of curing aging for humans, researchers have to do so called "lifespan interventions" experiments on animals to extend their lifespan. There are also several application that are highly focused on genetic aspects of aging. Denigma expressions app [http://www.denigma.de/expressions] that is intended to integrate transcriptomics, proteomics and metabolomics expression changes with the use of the powerful concepts of molecular profiles and signatures, set theory (i.e. intersections) as well as sophisticated meta-analysis. The interactions app that integrates interaction data from a multitude of resources which are considered as suitable and executes a robust unification schema on interaction information as well as maps the interactors to the correct biological entities via a powerful mapping algorithms that lives in the Annotations app. The aging process is very plastic. It can be modulated by genetic as well as environmental factors. Single gene mutations identified in various model organisms can extremely extend the lifespan, by up to 10 fold [Shmookler Reis et al. 2009]. Importantly, it appears that most of these genes are highly conserved between species [Wuttke et al. 2012]. In the genome there are genes that speed up aging (gerontogenes) and genes that slow it down (ageing-suppressor genes). Such genes have some common features and are connected to each other. 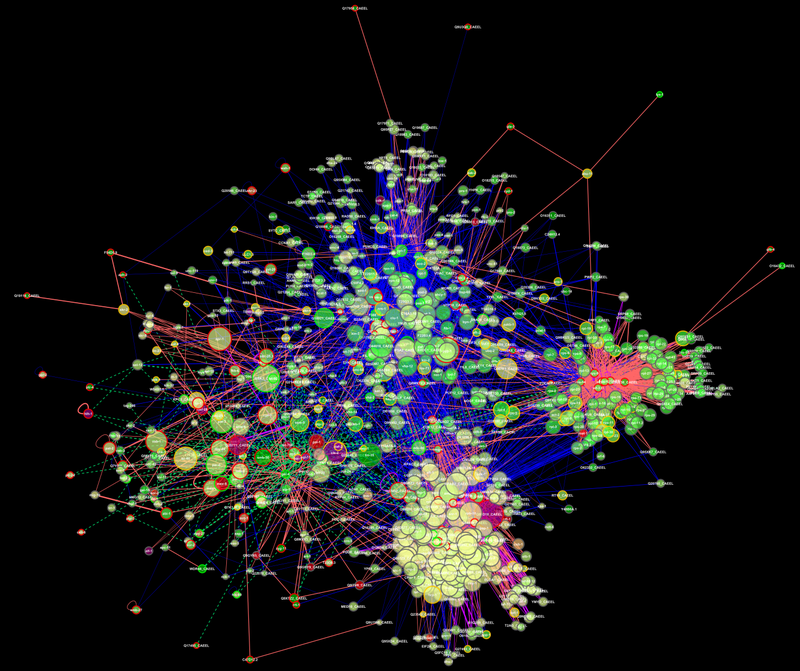 Network analyses of their interactions have been conducted [Figure: Interaction network of aging genes]. Figure: Interaction network of aging genes. Aging is also a social issue. As the importance of aging research is generally underestimated by the society, aging researchers have to face constant underfunding (esp. for fundamental research) and have to overcome a lot of barriers. So people who understand the importance of curing aging have to unite together, promote aging research and help the researchers to conduct their work. It is the way how Longevity Alliance [http://longevityalliance.org/] was created and how Denigma is being developed. Denigma is intended to be a hub for both aging research and all related activities (like lobbying and promoting). Currently a big part of social and project management functionality is in development. Denigma utilizes a crowdsouring approach, this means that code, services, ideas and content are created by soliciting contributions from a large group of people, and especially from an online community, rather than from traditional employees or suppliers. Crowdsourcing is different from an ordinary outsourcing since it is a task or problem that is outsourced to an undefined public rather than to a specific, named group [Jeff H., 2006]. The top level concept of Denigma is open Distributed Science developed and applied to longevity Research. Anyone can participate in these projects including people outside of the research community. The source code of Denigma is also open and located at [https://github.com/denigma/'>https://github.com/denigma/]. Deciphering Aging is a very complex task and is an issue for everybody (as each of us suffers or will suffer from aging), it is an issue of the whole society. It is too complex to be done only in academia (as a lot of promotion and programming are needed) and too important that needs people from all over the globe to be involved that is the reason why it has to be solved in distributive open manner. The aging process is the chief challenge which can be reverse-engineered. For this the construction of digital deciphering machine, the Denigma, is required [Figure: The Denigma project constructs a web intelligence that accelerates scientific progress (in particular in regard to research on aging) via effective collaboration and deep machine learning]. Denigma has three aspects which are necessary for its goals: research, programming and design. It is on the intersection of science, collaboration and machine learning. Denigma is a vision, and the first functional prototype of Denigma is available at [http://denigma.de]. 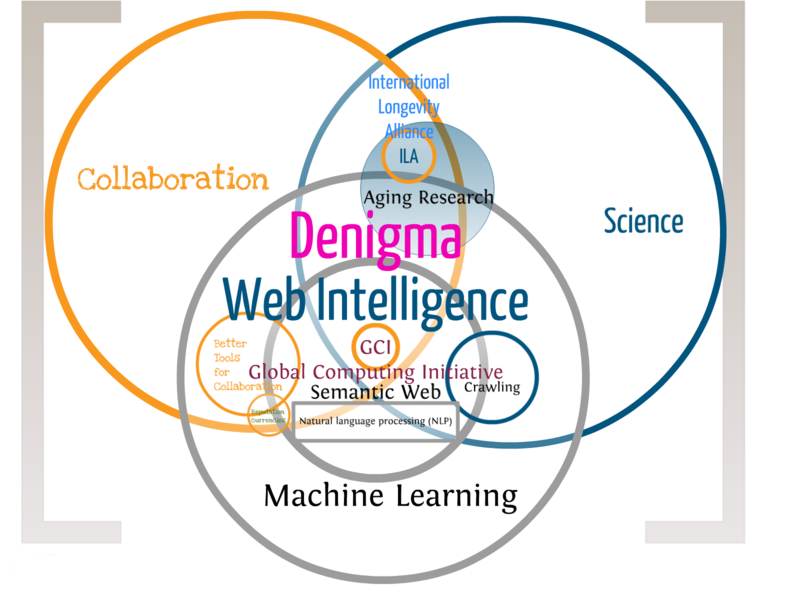 Figure: The Denigma project constructs a web intelligence that accelerates scientific progress (in particular in regard to research on aging) via effective collaboration and deep machine learning. Attwood TK; Kell DB; McDermott P; Marsh J; Pettifer SR; Thorne D (2009) Calling International Rescue: knowledge lost in literature and data landslide! The Biochemical Journal, 424, 317-333. Gruber T: Toward principles for the design of ontologies used for knowledge sharing (1995) International Journal of Human-Computer Studies, 43(5/6):907–928. Pishel I, Shytikov D, Orlova T, Peregudov A, Artyuhov I, Butenko G (2012) Accelerated aging versus rejuvenation of the immune system in heterochronic parabiosis. Rejuvenation research 15: 239-48. Shmookler Reis RJ, Bharill P, Tazearslan C, Ayyadevara S (2009) Extreme-longevity mutations orchestrate silencing of multiple signaling pathways. Biochimica et biophysica acta 1790: 1075-83. Wuttke D, Connor R, Vora C, Craig T, Li Y, Wood S, Vasieva O, Shmookler Reis R, Tang F, de Magalhães JP (2012) Dissecting the gene network of dietary restriction to identify evolutionarily conserved pathways and new functional genes. PLoS genetics 8: e1002834. Johnson AA, Akman K, Calimport SR, Wuttke D, Stolzing A, de Magalhães JP (2012) The role of DNA methylation in aging, rejuvenation, and age-related disease. Rejuvenation research 15: 483-94. Jeff H (2006) "The Rise of Crowdsourcing". Wired. Daniel Wuttke (Hevok) on May 31, 2013, 4:30 p.m.
Daniel Wuttke (Hevok) on May 31, 2013, 5:14 p.m.